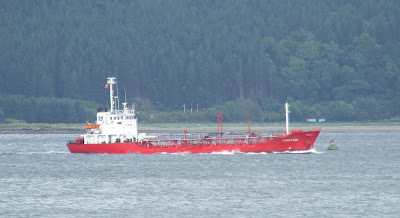 Another tanker seen leaving the Clyde today was the much smaller vessel FJORDTANK, which after spending yesterday in Brodick Bay, moved early this morning to Garelochhead to deliver a cargo of fuel to the Clyde Naval Base. Built in 1986 in Japan, FJORDTANK was originally named YAMABISHI MARU No. 21, before becoming TRITON IV in 1999. She took her current name two years later. A small vessel of 1,116 tonnes deadweight, she has an overall length of 64.50 metres. She is now operated by Sea Tank Chartering, on behalf of her Norwegian owners, Fjord Tankers. She flies the Panamanian ensign, and was heading for Antwerp this evening.